Goth news and Halloween, gothic and horror links. Bringing you into the darkness since 1993! 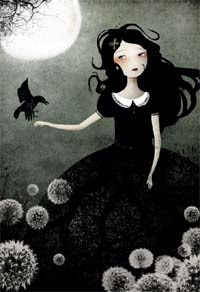 This French artist's dark art illustrations are of lovely dark-haired waifs and forlorn looking ladies wearing long dresses. There are also some fairytale illustrations here (Snow White and Rose Red; Little Red and the Wolf). My favorite is "My Only Friend," shown above. She also has a Whimsical Art gallery of girls in gossamer gowns, and her illustrations adorn some jewelry as well. A dark art show in Detroit, October 28-30 2010. "An exhibition of enlightened darkness." Artists include Chad Michael Ward, John U Abrahamson, Leonard Nimoy (yes you heard me right!) and Aunia Kahn. There will also be a masquerade, music performances, a dinner, and an absinthe tasting. This sounds incredibly cool, I would totally go if I lived within a couple hours drive. This is a different style of art than I usually share with you guys, and I almost didn't link it here. It's fabulous, but not spooky or goth. There are mystical forests, goblins, twisted trees, Druids, and fairies. 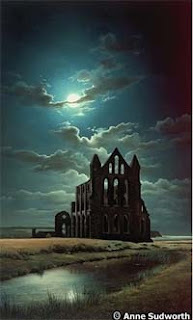 When I saw "Whitby Abbey" (shown above) I was convinced you will enjoy what you'll see here. Check out the artist's photo, probably the most stylish, fashionable artist photograph I've seen on a bio page yet! 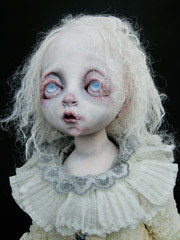 A French artist's gallery of dark, creepy artist dolls. 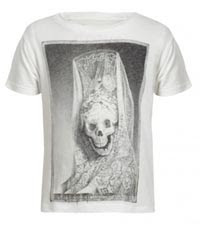 My favorite is the ghostly, ethereal "Ophélien" shown above. This is an incredible new magazine that you can buy online. Download the digital copy, or order a print copy mailed to you. I am so impressed by the high quality photography and stylized design here. I'm definitely ordering a print copy to keep in my archives, at least of the October issue for starters. Their blog (which you of course can read for free) is updated often and has very interesting things to show you. I haven't been this impressed with a new magazine in a long time. This reminds me exactly why I enjoy doing what I do here at Dark Side of the Net. This site posts links to public domain horror movies that are hosted elsewhere (Google Video, etc). If you're bored while working in another window, this is a great way to quickly find something interesting and horrific to watch, without having to take time to explore the video sites for yourself. They do a good job of keeping the links up to date, too. Goth rockers from California. The guitars are a bit too noisy and metal-y for my personal tastes, but they're getting good press and being booked for cool gigs including the Vampire's Ball. My favorite song of theirs on MySpace is "End of Days." An industrial rock/EBM band based in Chandler, AZ. They've performed at Convergence, and at the SLC Dark Arts Festival. 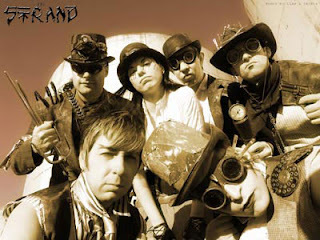 They also play at steampunk conventions. I'm listening to "Haunted" on MySpace right now and really enjoying having it in the background while I work on this blog post today. You already know about this important steampunk music resource, with news, event listings, articles, interviews and resources. I didn't have it in the Darklinks database for some reason, so making sure I get it in now. This radio show is posted weekly on Thursdays. You can download it or play the recorded stream in your browser. The show plays powernoise, dark ambient, noise, and industrial music. They've posted 51 shows so far - that is incredible dedication! This store confuses me, but also intrigues me. It's like a cross between Hot Topic, The Gap and Ralph Lauren. There's boring beige scarves and gray cardigans, but you can also pick up a Lady Death t-shirt for your little girl. The shop sells men's, women's, children's, jewelry and home items. The color palette is mostly gray, black, and cream. Definitely enough pieces here you could pick up some basics or things to layer with your existing fashion-maven-goth look. I probably won't be compelled to buy anything here personally, but it was quite interesting browsing around and I was surprised how much time elapsed before I was done looking. The shop is UK-based but has a web shop for the US. There are some really incredibly beautiful things here. Check out the 18th-century inspired black-and-white gown and this red rococo historical wig. The shop sells Marie-Antoinette and 18th-century France-inspired jewelry, wigs, costumes, and accessories - with a dark touch. An Etsy shop selling cute and spooky jewelry and hair accessories. There are also some steampunk items, like a pocket watch and a cyborg steampunk heart. An Etsy store selling lovely steampunk jewelry. They also sell steampunk corsets, harnesses, cufflinks, and goggles. 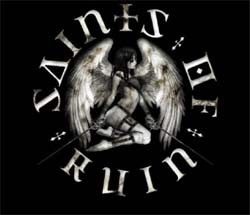 You can also get All Saints as an app for your iphone. That's how I browse it. Siouxsie and the Banshees: Spellbound, the Collection - Remastered tracks, just released on January 20, 2015.